From about 1964 David Plaistowe started investigating the origins of Chesham Bois House as some old Penn tiles (14th century) had been found and later when Roy and Anne Paton, the local historians, were carrying research of Chesham Bois, they too were interested in the house. In 2004 Roy suggested that a geophysical survey should be carried out so the Chess Valley Archaeological & Historical Society came and undertook one and a number of interesting structures were discovered which appeared to include foundations of earlier buildings and garden features. In 2005 excavation on the South Lawn identified two of the resistivity anomalies as a series of three floor surfaces the last of which comprised compacted chalk and lay above a medieval hearth, Hearths of this type, constructed of tiles packed together vertically, were characteristic of the principal room in large medieval houses and the focal point of household life. They were popular between the 14th and 16th century and were often placed in the centre of a room which would have had no chimney. Smoke would have escaped through gaps in the roof. Examination of the Chesham Bois House hearth suggests that in this case it was close up against a wall. It is notable for its size, about 1m wide by 3m long, suggesting that the room and house were also of significant size. A silver groat was dated to Henry VI (1422-26) was found and subsequent excavation a circle of carbon was discovered below the level of the hearth to the east. On further investigation this was found to be a pit of about 2 foot deep full of charcoal with a few pieces of large clinker which was waste from a former smithy. To the west of the hearth was found another fireplace built of red brick of a later date. Unfortunately it has not been possible to date these very accurately. In the spring and summer of 2007, CVAHS did some more work and reopened the trench containing the hearth and oven in order to find the full extent of the oven. They also reopened the trench with the large Tudor wall as they noticed a pit below the wall when Time Team were digging. This produced part of a bowl and many deer bones and boars tusks. Two trenches on the old bowling green were dug but the anomalies shown by geophysical survey did not produce anything of interest. There is a display of photographs showing the excavations including the Time Team dig on Open Days. 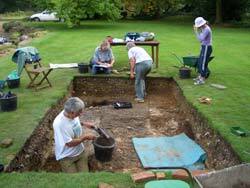 In the summer of 2012, CVAHS returned and planned for a week's dig in the garden but this was shortened owing to the terrible weather. They dug on the front lawn where the geophysics had shown some interesting signs but most of the finds were rubble from the old house except a good collection of sheep, cattle and horse bones were discovered probably from the nearby farmhouse. Another trench soon produced a path made up of Tudor brick rubble and was presumably built well before 1735 as was not shown on any maps of the 18th century.